If you have a delicate palate, you enjoy a good bite and you love pizza, then the wood-fired outdoor pizza oven is the right choice for you. Not only will your pizza taste great, but it will be prepared in a matter of minutes, which is perfect for outdoor parties and big gatherings with family and friends. It goes without saying that making pizza is fun. Combine it with the outdoors and you have yourself a recipe for hours of enjoyment. People of all ages can take on the task of making a pie. This is why I always preach the importance of having the right outdoor space, namely a brick patio, of course. Here is a picture of my niece making a pizza. At the time of the picture she was 16 and already a pizza expert. In the picture we are using a Chicago Brick Oven to cook our pizza. We have used these units in many of our designs. They seem to be a good fit. First of all, no matter how great your electric or gas home oven is, there is no way it can cook faster than the wood-fired one. Namely, an outdoor pizza oven, due to its unique design and shape, reaches high temperatures fast. Not only that, the heat is spread out evenly throughout the oven. Moreover, its walls stay warm for longer periods of time, compared to the electric or gas ovens. However, with your conventional home oven, you need to take some time to preheat it – usually up to 30 minutes – and the maximum temperature it reaches is around 500 degrees Fahrenheit. Furthermore, at these temperatures, it will take another 10-15 minutes for your pizza to bake. On the other hand, there is no need to preheat your outdoor oven. You simply fire the wood and as it burns, it emits heat that reaches up to 700 degrees Fahrenheit. At these temperatures, the baking time is significantly shorter, as your pizza will be ready in only a couple of minutes. Therefore, if you are one of those people who don’t like waiting when they are hungry, the outdoor pizza oven is the perfect solution for you. Moreover, the fact that it is able to bake in such a fast pace and retain heat for long periods of time makes a wood-fired pizza oven perfect for outdoor parties, where you need to entertain and feed many people at the same time. If you are a true pizza lover, you are sure to enjoy an outdoor wood-fired pizza oven, because of the unique flavor it delivers every time. Namely, the pizza that comes from this oven has a crisp and smoke-flavored taste that is impossible to replicate with the conventional home oven. Moreover, you are able to finetune the taste as well by selecting different types of firewood for the maximum pleasure of your taste buds. This is because the unique aromas actually come from the natural oils contained in the wood grains. In addition to that, you will get a crispy yet chewy crust, the toppings will be baked beautifully and the flavors will be infused to create a wonderful-tasting pizza. As we have already mentioned, once the outdoor wood-fired pizza oven is heated, the temperature is spread out evenly. This is very much different than conventional ovens, where you have colder and hotter spots, which means the food will take more time to bake. Moreover, conventional gas, propane, or electric home ovens use a lot of energy and the prices are getting higher each year. Therefore, a wood-fired pizza oven allows you to not only cook delicious food faster, but it will also potentially save you a lot of money. In addition to that, this type of oven uses an eco-friendly, renewable energy source that reduces your carbon footprint and saves the environment. However, make sure you take all measures of precaution around the open flames to prevent accidents from happening. That being said, check your local wood-burning regulations and go through any relevant restrictions that apply to the area you live in. Even though baking pizza in a wood-fired oven may seem complicated at first, there is actually nothing to it and the whole process is very simple. Namely, you prepare your pizza dough as you normally would, add sauce and your favorite toppings then bake it. The only thing that is different is that you will burn a nice little fire instead of flipping a switch. Next, add some cornmeal on your pizza peel before adding it to the oven. This is to help it slide in easier. Sit back, relax and in 2 to 5 minutes - depending on the thickness of the crust - you will be able to enjoy your own, delicious wood-baked pizza. A wood-fired oven is a versatile fireplace that is able to cook many other foods besides pizza. In fact, you may use it for meals that you are used to preparing in your conventional electric or gas oven. For example, you are able to use it to bake bread or as a grill for roasting meats. In addition to that, you are also able to briefly cook vegetables on the open flames, to accentuate their natural aromas. Moreover, the food that is cooked in a wood-fired oven will soak up the unique smoky flavor. Most importantly, due to the short cooking time, the food will be able to keep all of its nutrients and antioxidants. That way, you are able to prepare healthy and tasty food for the whole family to enjoy, with minimum effort and time needed. If you are a food enthusiast and truly enjoy a good bite, you will surely appreciate the way your food is prepared as well. Moreover, if you are a passionate pizza lover and wish to get a genuine experience on your own patio, then an outdoor wood-fired pizza oven is the right thing for you. Not only will it allow you to cook delicious pizza fast, but it will also serve as a versatile fireplace that you will be able to prepare many other meals in. The food will taste great, keep all of its nutrients and you will be able to feed many people at the same time. 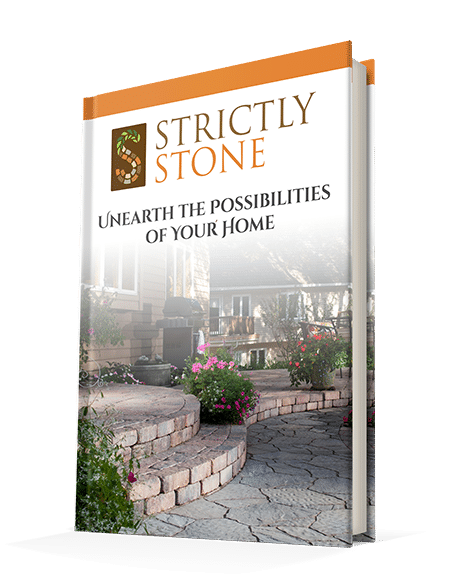 Download Ebook, "Unearth the Possibilities"
This eBook was created to help the homeowner recognize the true value of devoting an effort to creating an inviting outdoor space for the home. Let us help you open your eyes to the possibilities that outdoor living has to offer. This is your guide for ways of increasing the desirability of your home for you or future buyers and conscientious methods of sustainability within your space.